The Central Information Commission Prof M Sridhar Acharyulu noticed serious lapses in fire-safety of Supreme Court and Parliament buildings and directed on 25th Nov 2014 the Authorities to take necessary initiatives. 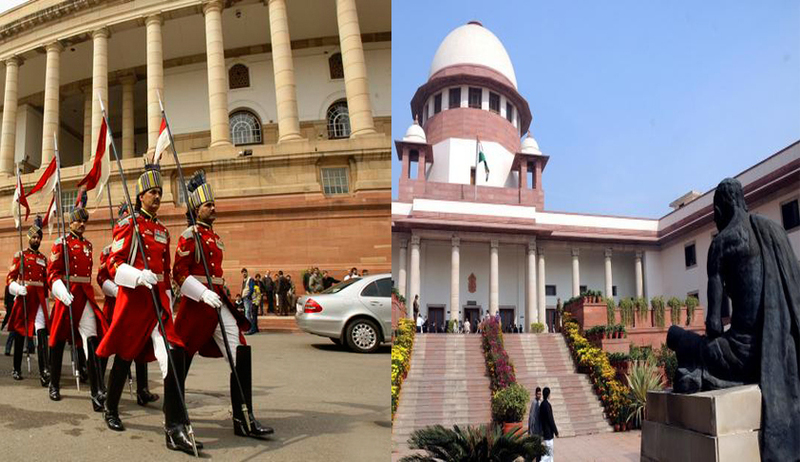 The Commission directed the CPIO of Supreme Court of India and Parliament of India to inform the appellant and the Commission whether they have Fire Safety Officer appointed in their respective buildings or not, if not why not and when they would appoint within 21 days from the date of receipt of this order. The Commission directed the respondent public authority, especially the head of the department, to take a serious note of fire-safety lapses in the buildings housing Supreme Court and Parliament and direct to appraise the authorities in Legislature and Judiciary about necessity and importance of taking the measures recommended by them. The Commission also recommended Respondent Authority, the CPIO of Supreme Court of India and Parliament of India to inform the appellant and the Commission as to what measures they have initiated to comply with the safety standards/ safety recommendations against fire, within one month from the date of receipt of this order. Mr Rohit Sabharwal has sought under RTI on 29.8.2013 copies of latest Fire Safety Certificates for buildings of Parliament and Supreme Court and the request letter in response to which certificate was issued. The CPIO denied information was related to sensitive buildings and could not be disclosed. On the direction of CIC, the Delhi Fire Services produced a file which revealed astonishing aspects such as no information was available whether any action was taken for over a decade about compliance of fire safety norms in Supreme Court. After making survey of existing fire safety arrangements, Delhi Fire Service wrote to the Dy. Commissioner of Police, Supreme Court Security on 30-9-2004, pointed out to several deficiencies and made 17 observations including some recommendations to safeguard Supreme Court from fire. Access: The width of the main gates was measured to 3.35 mtrs. The width of main gate for easy access of fire service vehicles shall be at least 5 mtrs. Corridors were encroached by almirah, lockers etc. The encroachment shall be removed. Pumps: Diesel pump was found defective. Sprinkler gong bell provided but not functional. No sprinkler actuation alarm was provided in the fire control room. Draw off connection from underground water storage tank was not provided. C. plant in basement shall be protected with sprinkler system. Fire extinguishers in Fire control Room were sent for recharging on 26.6.04. Fire extinguishers in basement were not maintained properly. One exit in basement was full of foam seats. Rubbish also accumulated in large quantity in A.C. plant room (basement). Proper house-keeping should be maintained. Zone No.22 & 26 at detection panel installed at Fire control room was lying out of order. Zone chart was not visible. C.Ps provided in the basement are not functional. Electric transformers of oil type shall be shifted to safe place and dry type transformer shall be installed instead of oil type. Ventilation provided between HT/LT, transfers room and corridor of main building shall be sealed. In case of fire break out, it will spread to upper floors. HT/LT panel room shall be provided with CO2 local flooding system. Additional exit signs shall be provided in the new building. Exit gate of Plaza canteen at ground floor was obstructed by A.C. duct. Door should be openable to the outside direction. No fire protection arrangement is provided. Open nozzle spray system shall be provided in LPG bank. Travel distance in C.A. and criminal wing is not meeting the requirement. Lock of emergency gate shall be kept open or key shall be provided near the gate for evacuation purpose in case of any emergency/fire. A. system shall also be extended on that wing. Hose Box was lying empty. Two delivery hoses & one short branch shall be provided at each hose box. Awareness programme should be arranged for staff members. With regard to the Building of Parliament of India, the Delhi Fire Service carried out a joint inspection on 3-8-2013 and suggested six corrective measures. Most of the staircase (main staircase No.1, 6 and small staircase No.7,8,9,10,11,12) were found locked/inaccessible due to cabin/office/storage of almirahs/storage of unwanted materials etc. These should be removed/cleared for easy evacuation in case of any emergency. Electrical room/services in the basement floor have not been provided with requisite fire protection except detection system. All the electrical panels shall be provided with local CO2 application system. All exposed cables should be painted with fire retardant paints. Temporary offices/cabins erected in the common corridor/escape routes shall be removed. In PMO basement, rear side corridor found locked by photocopier machines, etc., emergency light were also not functioning. In 36(A) basement (near Hon’ble Minister AK Antony) single staircase in basement is available and emergency light were also not functioning. Section 27 of Delhi Fire Services Act 2007 gives power to Director or any officer to remove encroachments or objects or goods likely to cause a risk of fire or any obstruction to fire fighting. Where a director considers such encroachments or objects or goods to be an imminent cause of risk of fire or obstruction to fire fighting, he may direct the owner or the occupier or erector of such premises or building to remove the encroachments or objects or goods forthwith and report the matter to the Sub-Divisional Magistrate accordingly. This section (3) gives power to SDM to seize, detain or remove the encroachments. He can even sell them in public auction. Under Section 29 owners of certain classes of building should appoint fire safety officer who shall ensure the compliance of all fire prevention and fire safety measures and effective operation thereof as provided in this Act. For example a cinema house where seating capacity of more than 1000 persons, a building with built-up area more than 10000 sq mts etc should have a fire safety officer. Section 31 empowers the Director to impose penalty in default of non-appointment of fire Safety Officer with a sum not less than ten rupees per square meter of area owned or occupied. Section 41 imposes liability of property owner to pay compensation to any other person suffering damage. Section 49 provides for imposing penalty for failure to take precautions which include three months imprisonment and fine. This commission has ordered recently: "Information regarding fire safety norms is life-related information. DFS has committed a grave breach of RTI by exhibiting an adamant attitude and denying information about inspection records of fire safety norms in Delhi. Their attitude fortifies apprehensions of corruption in selectively applying the fire norms and issuance of no objection certificate and using or not using the powers of disconnecting water and power to the buildings which did not comply with the norms". The Commission observed that this is a grave matter of life of hundreds of Constitutional office holders, hence the information sought is matter relating to life which should have been answered within 48 hours. The Commission feels that the respondent authority should have taken sufficient initiative to enforce all safety guidelines in Parliament and Supreme Court buildings by apprising the authorities in Legislature and Judiciary about the need of immediate action, instead of waiting nearly for a decade, perhaps with the hesitation not to cause embarrassment to higher authorities. The Commission directs the respondent public authority, especially the head of the department, to take a serious note of fire-safety lapses in the buildings housing Supreme Court and Parliament and directed to appraise the authorities in Legislature and Judiciary about necessity and importance of taking the measures recommended by them. The Commission also recommends Respondent Authority, the CPIOs of Supreme Court of India and Parliament of India to inform the appellant and the Commission as to what measures they have initiated to comply with the safety standards/ safety recommendations against fire, within one month from the date of receipt of this order. Fire broke out in the Andhra Pradesh High Court building, a heritage structure, destroying the chambers of five judges, a library housing valuable books and a mini-conference hall in the early hours of 31st August 2009. More than 100 firemen had to sweat it out for over three hours using 15 fire tenders to douse the flames that began around 4.30 a.m. Though the blaze was put out by 7 a.m., smoke continued to billow out till evening prompting Fire Service officials to continue fire-fighting operations and deploy teams of firemen at the spot to face any eventuality. The Hindu commented: “Waiting to happen: Firemen spraying water to put out the fire in the High Court building”. The Commission observed that public authority had learn lessons from this fire accident.